Gold prices fell for a second session on Wednesday as physical demand remained muted and as the US dollar picked up additional strength against the euro. Market participants were focused on upcoming Fed and Davos World Economic Forum statements before making any substantial bets in the precious and base metals’ spaces. Gold’s decline was partially attributable to the fact that Greek debt instrument holders failed to come to an agreement with that country as regards a debt-swap plan. The impasse prompted a "risk-off" day on Tuesday and the same sentiment spilled over into this morning’s trading action. As regards the Fed and its policy statement to be made later in the day, the pundits expect the US central bank to stand pat on rates and to offer some language that implies an extension of current ultra-low rates for some time to come (estimates range from one year to two). However, there are also expectations that some words will be set aside to cover the idea that when rates do need to rise, they will do so without any hesitation on the Fed’s part. To wit: "Despite all protestations at the moment, if the economy continues to expand at its recent trend, the Fed would almost certainly be prepared to exit at the start of 2013." said Joel Naroff, the President of Naroff Economic Advisors. For the moment, it would appear that Mr. Bernanke’s institution wants to do very little to upset the US economic apple cart (expected to make progress at the rate of about 3% this year). That stance however could also include not promising any QE3 to those who so desperately hope it happens so they can sell more hyperinflation scaremongering-laden newsletters. In fact, more than a handful of economists are actually expecting inflation to… fall in coming months — Goldman Sachs among them. The firm projects that US consumer price inflation will decline from 3.3% to 1.9% by the end of this year. The Fed could lay out an explicit inflation target as well (2% or so), and it will present rate projections being made by its policy-setting members. The markets could react with outsized moves or take the projections in stride and greet them with a yawn as most figures that could be tendered are presumably already ‘baked’ into current value levels in various key assets. BMO analysts said that they are not looking for additional Fed asset (bond) purchases due to the improved manufacturing and labor market metrics being seen in the US economy of late. Spot prices opened $12 lower in gold, which was bid at $1,655 the ounce while silver lost 20 cents to open at the $31.85 level. The gold market play of the day was still Fed-dominated. Analysts at Standard Bank (SA) noted this morning that "some anxiety has crept into the minds of some investors due to recent economic data flow that has shown a strengthening US economy. Some fear that this might alter the Fed’s long-term view and prompt a reigning in of monetary policy, earlier than originally expected. Therefore, if today’s view on the Fed funds rate appears more hawkish than what markets are currently expecting, we could see gold, as well as the other commodities, lose some ground. This would be the case if Fed members see a rate hike happening earlier than 2014." Meanwhile, would-be buyers in China were still celebrating the arrival of the Lunar New Year, whilst those in India were sidelined amid expectations of a larger-scale decline in prices (target prices being cited in the neighborhood of 27.000 rupees for gold and 52.000 rupees for silver by locals). Others, however, expect a more significant, structural shift to possibly occur in gold after the middle of this year and going forward for an as yet unknown period of time. Global investment offtake in gold is projected to decline by some 250 tonnes in the first half of 2012 notwithstanding decent odds of a final push to higher price levels, even potentially record ones. Platinum dropped $4 to start the midweek session off at $1,542 and palladium fell $2 to the $672 mark per troy ounce. The gold-platinum differential was approaching $100 in a continued narrowing. 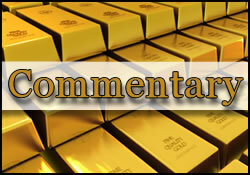 Rhodium remained unchanged at the $1,400 per ounce bid quote. Background metrics offered a mostly red-tinged price list in base metals (copper down 1%, along with aluminum and lead losing over 0.50%) and in crude oil (off by 0.60% at $98.40 a barrel). The euro slipped to $1.295 against the greenback following a hefty rise in Portuguese debt insurance premiums and the yen fell to a two-month low against the American currency in the wake of that country’s first trade deficit to be reported since 1980. As far as the European situation goes, there are still variables remaining to be worked out (the size of the so-called ‘haircuts’ that bondholders might take on Greek debt, the ratings game involving various European financial institutions as well as sovereign debt, etc.) but there is at least one school of thought that envisions a collapse of the Greek economy, no matter what happens in the broader sense. According to Steve Hanke of Johns Hopkins University, the "game" — for Greece — is "completely over." Mr. Hanke cites the 16% shrinkage in that country’s money supply as the fuse that will light the implosion. In separate news, the IMF projects a slowing in global economic growth and it has warned of the spillover effects of the European debt crisis on the same. Global growth for 2012 is now anticipated to come in at the 3.3% level as against a previous (Sep. 2011) forecast calling for a 4% rate of expansion. Meanwhile, more than 70 of the world’s billionaires are huddled in "Camp Igloo" — their snow-laden hideout in Davos, Switzerland, trying to pay more than just lip service to the vexing issue of income inequality. This is now taking place in the wake of the 2011 "Arab Spring" and the "Occupy Everything" movements that have certainly rattled their nerves, of nothing else. Some see this year’s summit as an attempt to "remodel" capitalism. Good luck with that, we say. Behold the school of thought that sees the rise of modern (American) capitalism as having its roots in… slavery. Yet, then, as now, "A major financial crisis in 1837 revealed the interdependence of cotton planters, manufacturers and investors, and their collective dependence on the labor of slaves. Leveraged cotton — pledged but not yet picked — led overseers to whip their slaves to pick more, and prodded auctioneers to liquidate slave families to cover the debts of the overextended." Substitute those cotton planters with, say, today’s oil producers and the slave families of 1837 with today’s "99%" and you have the beginnings of a present-day picture of a similar "interdependence." Little wonder then, that capitalism is seen as being in crisis by so many (one of them being Prof. Richard Wolff of UMass/Amherst). How this crisis will be managed will dictate the essence of many a yet-to-be-written page in the history books. Disturbingly however, "U.S. investors are not convinced that income inequality is a threat to the economy: a majority of those surveyed say it does not hinder growth. More than 50 percent of Europeans and 60 percent of Asians think otherwise." reports Bloomberg News in its latest article on the issue. To wit, the GOP’s Mitch Daniels in his State of the Union rebuttal speech — a classic case of fear-mongering-laden rhetoric — identified President Obama as being "pro-poverty" (???) instead of focusing on the income inequalities that prompted said President to call for higher taxes on the… rich. In his State of the Union address last night, Obama called on Congress to embrace a tax plan named for billionaire Warren Buffett that would require those making $1 million or more pay at least 30 percent in taxes. With congressional gridlock heightened by the 2012 election, there is little chance the proposal will pass," reports Bloomberg News. In The Lead – Written In Cement? Mr. Nadler comes through again by stating, “Gold prices fell for a second session on Wednesday” on a day when on the very same day we read a CoinNews.net reports that ‘gold soars through $1700 an ounce’. The Kitco chart shows a low of $1648 and a high of $1711 today. But Mr. Nadler seems to ONLY report when gold dips. After some profit taking by investors over the next day or so, he’ll probably pop in with another ‘down gold’ day report. How he can continuously bash gold and work for Kitco is completely beyond me. Does anyone else notice this pattern of reporting one side of the proverbial coin?